The world of Kodi is a vibrant and highly active one. If you are still using a satellite dish or cable in this era, I strongly recommend you cut the cord and stream contents online. For cord cutters, Kodi is an eye candy. But if you are a beginner, then it’s appropriate for you to know that Kodi is a “free” and open source media player application that allows you to play and view podcasts, videos, music and pictures. The software itself is legal and platform agnostic and it utilizes add-ons to enhance its performance. Also Read: How to Fix Kodi Couldn’t Connect to Network Server. Obviously, there are a ton of add-ons that can help jumpstart your Kodi experience and “one such” add-on is Indigo, ideal for veterans and professionals alike. 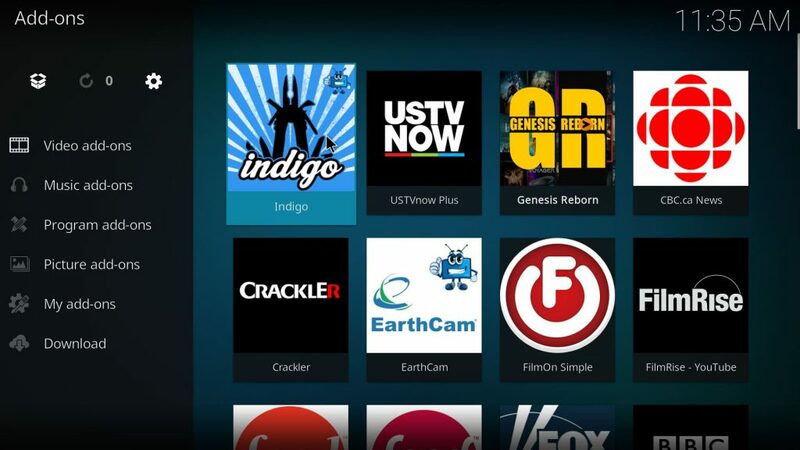 For one thing, indigo serves as an ultimate​ toolkit for managing your other add-ons on Kodi. It also includes maintenance tools as well as backup and restore functions and if you’re an advanced Kodi user, you can easily use indigo to tweak settings, clear cache and even check log files on Kodi. Indigo doesn’t bring any streamable contents, but instead it’s a sort of meta add-on that lets you install new add-ons on Kodi even if you don’t know the specific repo the add-on is located in. Indigo typically makes installation of new add-ons so much quicker and easier, than having to install each one manually. It’s an all-in-one toolkit for keeping your Kodi healthy but has lost its glory in the eyes of some users. As a suite of repair and diagnostic tool, it isn’t a surprise that indigo is popular, but it’s quite disappointing when you fire up Kodi on your firestick only to be prompted with “Indigo error check the log for more information”. Now knowing that you have recently updated the indigo addon and still can’t access playback from your feed, you’d be discouraged. Fortunately, we’ve a permanent fix to Kodi indigo error, but first lets see why you’re being faced with this issue. If you are wondering what causes indigo error on Kodi, then we are going to unveil the possible reasons. Firstly, it may be a bad update. There are a ton of users who reported that after updating indigo from version 4.0.3 to 4.0.4, they started getting the error. Secondly, it may be that the indigo addon got corrupted or didn’t install properly. Another reason why you might encounter Kodi indigo error is if indigo itself is unable to fix an addon that’s in an error state. Whatever the reasons might be, simply ensure you have an active and stable internet connection and follow us as we guide you through the ultimate steps to fix Kodi indigo error. Also Read: The Best Kodi Alternatives That Are Worth Trying Out. As we stated earlier on, the major reason why you often get indigo error whenever you open Kodi is because of a bad update. If indigo was probably working fine prior to installing a new update, then you should rollback to the previous version since the new update might have come with some bugs which broke the module. So what you will need to do is to uninstall the version 4.0.4 of indigo addon (i.e if it’s the newest update​ you made). Then look inside your repositories and find the previous version 4.0.3 of Indigo addon and reinstall it. Once done, ensure to turn off auto update. That is it, the Kodi indigo error should be fixed now. But if it doesn’t​, then ride with us to the second method. Personally, the above method solved the indigo error that pops up whenever I open Kodi, but if it “doesn’t” work for you, then you’d be left with no other option than to completely uninstall and reinstall indigo addon. So go ahead and navigate to your add-ons​ section in Kodi, look for indigo and right-click on it. Then select Add-on information and hit the uninstall button. Now that you’ve had indigo uninstalled, you may reboot your device only to see kodi working properly without showing the indigo error message once launched. Now lets reinstall the indigo addon from a fresh repository. Directly from Kodi home screen, click on the Settings icon that looks like a gear. From here, choose File Manager followed by Add source. Next up, click on the box where it says <None> and enter the following URL without omitting anything. Now give the source a name like Indigo and click OK.
Once that’s done, navigate back to Kodi main menu and click on Add-ons. Then click on the package icon that looks like an open box. On the next page, click on begin-here followed by the plugin zip file that says program.indigo-.4.0.3.zip. Now select Install from zip file and wait till you get the indigo add-on installed message. That’s it, you can now access indigo from the Add-ons section in your Kodi home screen. Indigo is undoubtedly your gateway to the world of unofficial Kodi add-ons. There is probably the reason why it is so popular. It comes quite in handy and it’s also one of a kind. So if you have ever fired up the Kodi application only to get this message “indigo error check the log for more information” then you should use the above tested methods to fix it permanently.